In Puerto Pollensa there is a lovely market every Wednesday morning. From 09.00 o´clock locals will be waiting to welcome you with their fresh products like fruits and vegetables, almonds and nuts, cheese and meats. You will find a big collection of accessorizes, bags, clothes and shoes. Also, flowers and plants to brighten up your holiday apartment or villa are possible to buy on the market. Something typical Mallorquin to take home or present family or friends and beautiful craft goods, everything is available on the market in Puerto Pollensa. It is not a very big market, even the gentlemen will be fine as there are nice bars and restaurants around for them who like to have a small break in between the walk around the market. This all takes place on the Wednesday morning in the center of Puerto Pollensa, on the main square there where is the church of this beautiful village. 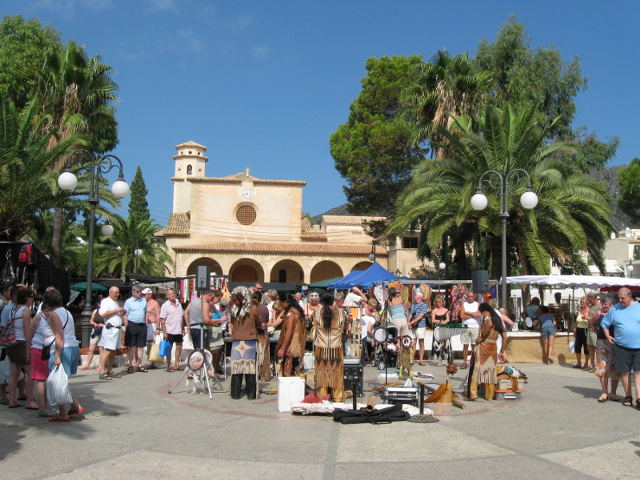 Almost all streets of Puerto Pollensa are leading to the main square, so you can´t miss the market! And the market-lover is definitely at the right place in Puerto Pollensa! There is only one street leading to the No Frills office.. Along the boulevard, very close to the Burger King you will find the office to book your Excursions and to get your local information! Don´t hesitate and visit Mar in the No Frills Office, she will be more than happy to help you with anything you like to know.